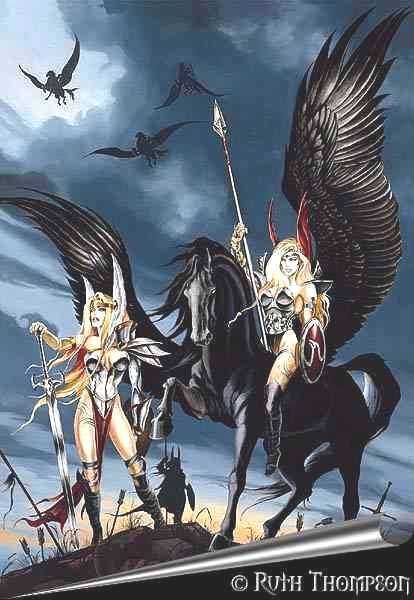 In Norse mythology the Valkyries are dísir, minor female deities, who served Odin. 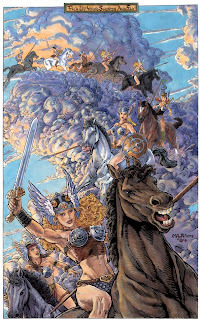 The Valkyries' purpose was to choose the most heroic of those who had died in battle and to carry them off to Valhalla where they became einherjar (lone fighters). This was necessary because Odin needed warriors to fight at his side at the preordained battle at the end of the world, Ragnarök. In Valhalla the Valkyries also "serve drink and look after the tableware and drinking vessels". It appears, however, that there was no clear distinction between the Valkyries and the Norns. Skuld is for instance both a Valkyrie and a Norn, and in the Darraðarljóð, the Valkyries weave the web of war. Odin sends the Valkyries to every battle. They allot death to men and govern victory. Gunn and Rota [two Valkyries] and the youngest Norn, called Skuld, always ride to choose who shall be slain and to govern the killings. In modern art, the Valkyries are sometimes depicted as beautiful shieldmaidens on winged horses, armed with helmets and spears. However, Valkyrie horse was a kenning for wolf, so contrary to the stereotype; they did not ride winged horses. Their mounts were rather the packs of wolves that frequented the corpses of dead warriors. They were gruesome and war-like. Whereas the wolf was the Valkyrie's mount, the Valkyrie herself appears to be akin to the raven, flying over the battlefield and "choosing" corpses. Thus, the packs of wolves and ravens that scavenged the aftermath of battles may have been seen as serving a higher purpose. the 'Aurora Borealis', or 'Northern Lights'.